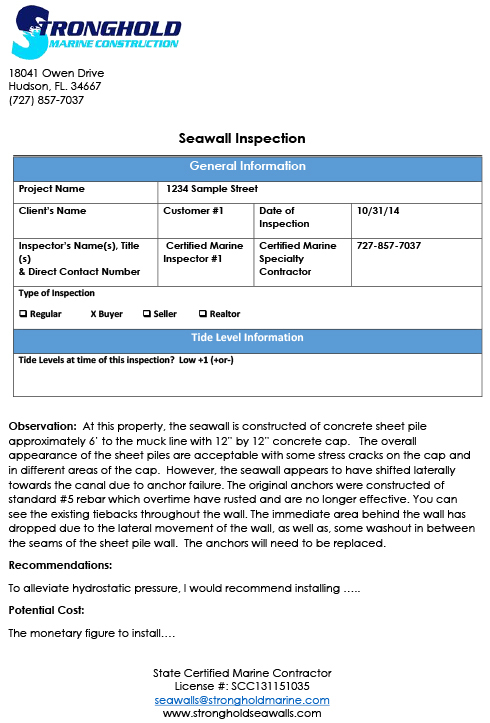 Seawall Inspections — Stronghold Marine Construction, Inc.
Are you looking at buying or selling a waterfront house? The seawall is a factor that may make or break a deal. We can come out and analyze your seawall for any needed repairs. Stronghold Marine Construction will give you a written analysis of the condition of the seawall on the property or if a new seawall is needed. Knowing the condition of the seawall prior to selling your home gives you confidence that you're selling a seawall is going to last. Knowing the condition of a seawall prior to purchase, helps you choose the right property and gives you peace of mind..